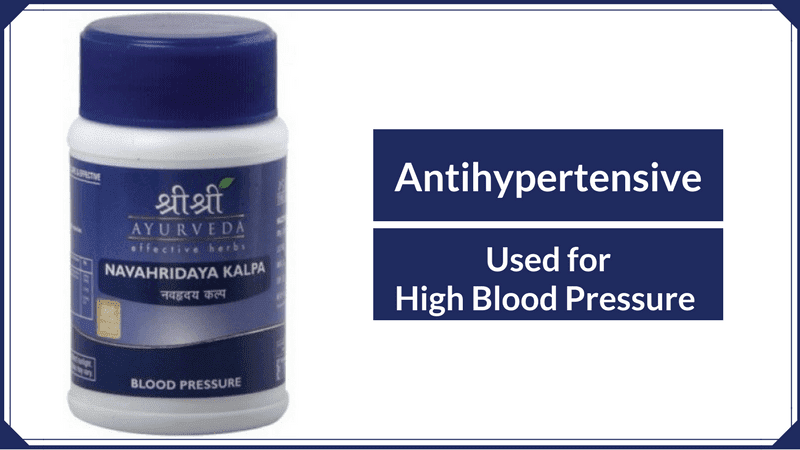 Navahridaya Kalpa is an ayurvedic proprietary product used for the management of high blood pressure (hypertension). It is a unique herbal combination of herbs that act on the mind and heart. Its ingredients have antihypertensive, adaptogenic, cardioprotective and neuroprotective effects. Navahridaya Kalpa has following healing properties. Soporific (Sleep inducing) property of Navahridaya Kalpa is attributed to the presence of Sarpagandha in it. Other ingredients also support to induce a quality of sleep. In severe cases of insomnia, it can also be used along with Narayana Kalpa. Here we will review the effects of Navahridaya Kalpa in the management of high blood pressure. Navahridaya Kalpa is a good herbal medicine to manage mild to moderate hypertension. Sarpagandha reduces the elevated blood pressure and Ashwagandha helps to strengthen the heart and stabilize the blood pressure at the normal range. In addition, it is also anti-stress and adaptogenic herbs, which helps to reduce stress and calms the mind. The most of other ingredients help to balance Tridosha and improve overall mental as well as physical health. Navahridya Kalpa contains herbs, which are considered safe and well-tolerated. There are no side effects observed with Navhridaya Kalpa. I have high BP 150/85.age 40.i have taken telmisartan with amlodipine tab last 3 year. If I will take Sri Sri Tattva Nava Hriday Kalpa with allopathy is there any problem? Navahridaya Kalpa lowers blood pressure, so you require daily BP monitoring. You may also require changing dosage of your current medications accordingly.